The grand celebration of the 64th birthday of Princess Ruta Keelikolani Keanolani Kanahoahoa Muolaulani Keikiheleloa Keanohalia Kaleonahenahe Kohalikolani at her newly completed Keoua Hale, 1882. Birthday of Her Royal Highness Princess Ruth Keelikolani. Her Royal Highness Princess Ruth Keelikolani celebrated, on Thursday last, her sixty-fourth birthday by a luau, or banquet in native Hawaiian fashion, given at H. R. H.’s new mansion in Emma-street, followed on the evening of Friday by a Reception and Ball. The occasion was indeed adopted for the “house-warming” the handsome and beautifully decorated house being only just ready for occupation. The event has been long talked of, and looked forward to, and has been the chief topic of conversation during the past week, almost to the exclusion of all others, causing the exciting events of the previous week to fall quite into the background. 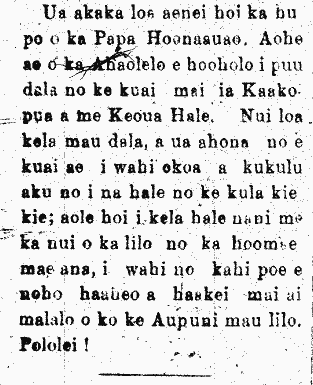 Criticism on the purchase of Keoua Hale, 1895. The stupidity of the Board of Education has been made clear. The Legislature has not approved the money to purchase Kaakopua and Keoua Hale. This is a huge sum of money, and it is better if they purchased some other land and built buildings for the high school, and not that beautiful house which will cost a lot to clean it up, as a place for a few people to live haughtily and snobbily off the money of the Government. It is true! Ka Makaainana, Buke IV—-Ano Hou, Helu 7, Aoao 8. Augate 12, 1895. Keoua Hale furnishings put on auction, 1895. Keoua Hale was crowded this past Tuesday with people going to see the auction of the furniture of Bishop. The bed of Keelikolani went for $200. Ka Makaainana, Buke III—-Ano Hou, Helu 2, Aoao 8. Maraki 18, 1895. Keoua Hale becomes Honolulu High School, 1895. Honolulu High School [Kula Kiekie o Honolulu]. Birthday of Princess Keelikolani, 1882. BIRTHDAY OF HER HIGHNESS RUTH KEANOLANI KEELIKOLANI.